The latest spinoff of the Incredibly Easy! Series (R), the Incredibly Visual! Pocket Guides are compact, carry-anywhere references that use stunning full-color photos and illustrations and brief, easy-to-read text to present must-know clinical concepts. Ideally suited for visual learners, the information is easy to learn and recall because the visual images leave a lasting impression, and most topics are covered on a two-page spread. 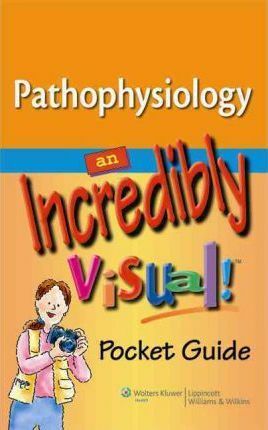 Pathophysiology: An Incredibly Visual! Pocket Guide presents risk factors and pathophysiologic changes associated with more than 150 disorders and health problems, including heart failure, valvular disease, ARDS, asthma, lung cancer, pressure ulcer, stroke, AIDS, rheumatoid arthritis, hypertension, and more.